All the ingredients except for the halibut and bacon can be found at the farmers market. Thus was the inspiration for this recipe. Karen and I look forward to seeing you there … Enjoy! Place one tablespoons olive oil and sliced bacon/pork belly in a large 12-inch skillet that is 2-inches deep and has a cover. Cook over medium heat until bacon is almost crisp. Drain off all but 2 tablespoons fat. At this point, turn skillet to medium high and add spinach plus salt and pepper to taste. Lightly toss spinach. Spinach should be slightly wilted. Add the balsamic vinegar and fresh lemon juice Put cover over spinach for, literally, 10 seconds counting slowly, remove immediately from heat. Place in four individual shallow bowls 6 inches in diameter, placing the fresh cooked halibut in the center of the bowl. 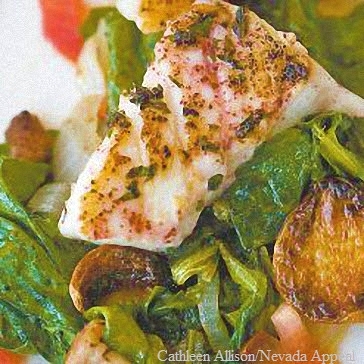 Or, for family style, place the spinach mix on a large serving dish, placing the cooked halibut filets around the edges. Place halibut filets on paper towel and pat dry. I like to sear halibut for 1-2 minutes on each side (due to its delicate nature) in a skillet and finish in the oven at 350 for 15 minutes using specified size filets above. Or to barbecue, heat barbecue grill to approximately 350 degrees, place halibut on foil 8-10 minutes each side. First, have all items prepped for the spinach mix. Preheat oven to 350 degrees. Once complete, you are ready to cook. Seer the fish and put in the oven or barbecue. While the halibut is cooking, combine spinach mix and the finish time will be perfect to serve and enjoy.